Rila Monastery as it exists today is a relatively modern building, given its millennial past. Situated 100 miles south of the capital Sophia, the monastery sits in the rural valley of the Rila Mountains, surrounded by meadows and pine forests. The second-largest monastery in the Balkan region, it is fortress-like, shaped like a rough pentagon, with 80-foot walls that shield an internal courtyard whose airy porticos and colonnades are decorated with vibrant frescoes. Several sacred places surround the monastery, including holy springs, a holy cave of the founder, and five hermitages. A small monastic community serves the monastery today. “Rila” is the ancient Thracian name for water, and the 60,000 acres of the nature park that surround the monastery complex are studded with glacial lakes and rivers. The land is characterized by meadows, old-growth coniferous forests, and alpine peaks that climb as high as 6,000 feet. Bulgaria is the third-most biodiverse country in Europe, and although the nature park occupies only about a quarter of a percent of the country’s territory, it contains nearly half of Bulgaria’s plant species and a third of its vertebrate species, including rare wildlife like the imperial eagle, the black vulture and the wolf. Rila Monastery was established in the ninth century by a Christian hermit known as Ivan Rilski, or John of Rila, who lived and wandered in the Rila Mountains for 40 years. Despite this isolation, his reputation as a man of profound religious faith spread, and he eventually founded a monastery by a cave he occupied in the mountains. Ivan Rilski is reputed to have performed several miracles, including healing the sick, and when he died in 946 his relics became objects of reverence; pilgrims still visit his relics in the monastery, and he is recognized as the patron saint of Bulgaria. After his death, the monastery gradually grew, and hundreds of monks came to live there, meditating and praying, recording religious texts in manuscripts, and cementing the monastery’s reputation as a center for Christian art and music. During the 15th century, Bulgaria fell under Ottoman rule; some churches were allowed to remain, but others were converted into mosques. The Ottoman leaders turned control of most Bulgarian Orthodox institutions to the Greek Orthodox Church. 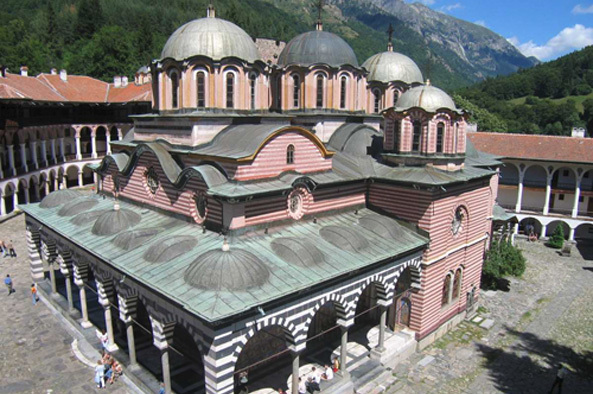 Rila Monastery, however, retained its Bulgarian clergy and continued to conduct services and rites in the Bulgarian language. The monastery also became a repository for thousands of illuminated manuscripts, painted icons, detailed religious woodcarvings, and large icon panels knows as iconostasis. In the late 18th and early 19th centuries, Rila Monastery was at the center of a surge in national consciousness that would eventually lead to an independence movement and liberation from Ottoman rule in 1878. A series of fires destroyed much of the monastery during this time, and some of Bulgaria’s most renowned architects and artists would rebuild the monastery as it looks today. Independence was brief, however. After World War II, the Soviet Union occupied Bulgaria and instituted communist rule, during which time the Bulgarian Orthodox Christian Church was dissolved and all church lands were placed under state control. In 1983, Rila Monastery was inscribed in the UNESCO World Heritage List, in recognition of its cultural value. In 1989, soviet-era rule ended and was replaced by a multiparty system. In 1991, the monastery was reinstated as church property. The lands surrounding the monastery were named as part of a national park a year later, but in 2000, these lands were restituted to the church and the Rila Monastery Nature Park was formed. Over 75 percent of the land now belongs to the church, with the rest under the jurisdiction of Bulgaria’s Ministry of Environment and Waters. Approximately half a million tourists and pilgrims visit Rila Monastery and Nature Park every year, making it one of the most visited protected areas in Bulgaria. Soon after the nature park was established in 2000, Bulgaria began to draft a management plan to address issues like tourism control and sustainable forestry. The management plan was developed with the cooperation of the Bulgarian Orthodox Church, the Bulgarian government and environmental NGOs, but church participation was inconsistent. A draft of the management plan was submitted in 2004, but because of a typographical error when the draft was published in the State Gazette (the country’s journal for public notices) and a court case filed by the Bulgarian Orthodox Church contesting some of the zoning and programmatic aspects of the plan, it has yet to be adopted. With the appointment of a new abbot to the monastery, expectations are that the court case will soon be resolved. The draft management plan includes provisions for limited hydropower development along the rivers within the nature park. Currently, there are several existing hydropower facilities that supply electricity and drinking water to nearby towns. Several more small-scale hydropower facilities are planned along the Rilska River and its tributaries, which run through the nature park, and conservation organizations contend these projects will harm riparian and aquatic environments. While development in the nature park has been limited, environmentalists have waged a highly publicized protest against ski development in the adjoining Rila National Park, directly west of the nature park, a site which features culturally and spiritually significant lakes, springs and mountains. Ski lifts have already been built in the Rila National Park buffer zone, in violation of existing management rules, and investors continue plans to built a “mega-ski complex” in the buffer zone, which will include thousands of hotel rooms and miles of roads that will require timber clear-cutting, some of which has already begun. Bulgaria’s environmental decisions are now facing increased scrutiny by the international community. In 2007, Bulgaria joined the European Union, and with that membership came directives for environmental sustainability and anticorruption. In 2009, it joined Natura 2000, the largest network of protected areas in Europe. The Rila Monastery and its surrounding landscape have provided ecological and spiritual sustenance to the Bulgarian people for over 1,000 years. The current preservation efforts are meant to continue that venerated tradition. If you go to Rila Monastery and Rila Monastery Nature Park, recognize the site as a destination for religious pilgrims and tourists alike and act accordingly. Read “Ethics for Visiting Sacred Sites” to learn more. Become a member of Green Balkans, the largest conservation group in Bulgaria. Sign petitions to protect Bulgaria’s forests and environment. Aladjem, Svetlana, EcoLogic Consultancy. Personal communication, February 23, 2009. Chandler, Katherine. “Bulgarian Ski Complex Threatens Rila National Park.” CorpWatch, January 4, 2008. Chiclet, Christophe. “A Monastery in the Mountains.” UNESCO Courier, June 1996. Ralev, Andrey, Balkani Wildlife Society. Personal communication, February 17, 2009. United National Educational, Scientific and Cultural Organization. “Rila Monastery.” UNESCO World Heritage Center. WWF. “WWF’s work in the Danube-Carpathian region.” WWF. WWF. “Europe’s Safety Net Extended to Romania and Bulgaria.” WWF, January 14, 2009.